Power Equipment Direct Announces Best Chipper Shredder Vacuums. Recommendations Based on Sales History and Customer Reviews. When the trees in your yard dump leaves and sticks, you're stuck raking them up. But with a chipper shredder vacuum, you can just wheel around your lawn and collect them all quickly and easily. Today PowerEquipmentDirect.com announced its recommendations for the best chipper shredder vacuums. "When the trees in your yard dump leaves and sticks, you're stuck raking them up," said Mike Sawisch, resident product expert at Power Equipment Direct. "But with a chipper shredder vacuum, you can just wheel around your lawn and collect them all quickly and easily." According to Sawisch, most retailers are loyal to whatever chipper vacuums are in their store. PowerEquipmentDirect.com, however, isn't your ordinary retailer. The online superstore specializes exclusively in electric and gas chainsaws, carrying more than 65 models from the nation's leading brands. In addition, Power Equipment Direct offers wood chippers, as well as a wide assortment of safety equipment and accessories. The online retailer combined recent sales history, customer reviews and personal insight to generate their final recommendations. 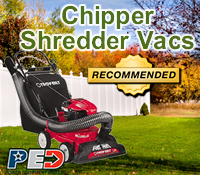 Once the dust and data settled, only 3 chipper shredder vacuums sold by PowerEquipmentDirect.com were given its prestigious "Recommended" status. In addition, the expert staff personally wrote online reviews for each chipper shredder vac, explaining why the company recommended it. By providing the recommendations and reviews, PowerEquipmentDirect.com hopes to arm shoppers with enough ammunition to pick the perfect chipper shredder vacuum for their needs. Power Equipment Direct operates 10 niche online superstores. In addition to ChainSawsDirect.com, the Bolingbrook, IL-based company operates AirCompressorsDirect, ElectricGeneratorsDirect, LogSplittersDirect, MowersDirect, PressureWashersDirect, SnowBlowersDirect, SumpPumpsDirect, TillersDirect and WaterPumpsDirect.